We’ve been working with Simply Sanding for years and we’re proud to say that these hard working Essex-based floor sanders, installers and refurbishers were one of our first clients. While Simply’s owners have a high-level understanding of how to deal with wooden floors in all sorts of states of disrepair, their expertises do not extend to Internet technology. Nevertheless, Simply Sanding has long recognised the importance of investing in a professional web presence and a WordPress content strategy. We’re mightily honoured to have played a role in the development and growth of Simply Sanding. 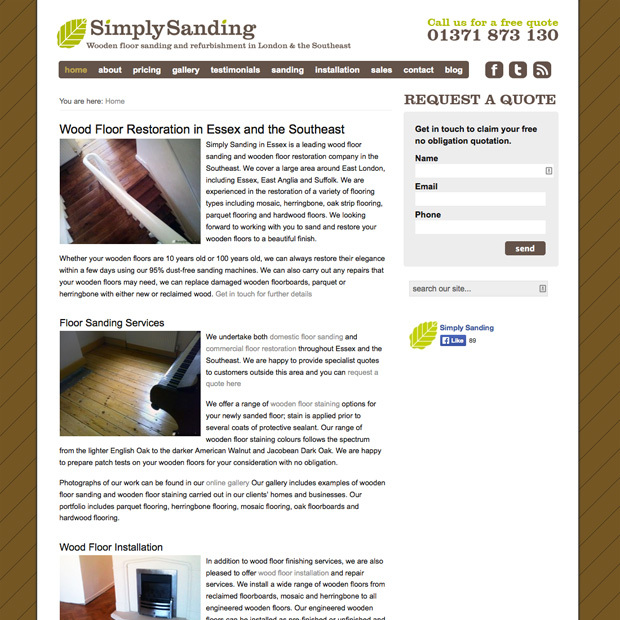 Simply Sanding came to us after making do with a home-made static HTML site. They were ready to level up and had a very clear vision for their new site. The starting point was a new logo to project a clear corporate identity to be used in a variety of contexts – both virtual and real world. For the website, there was a preference for a very ‘simple’ site with a text-heavy homepage, search optimised content, integration with a new Facebook presence as well as easy access to photographs of the company’s work, pricing information, and company contact details. Since launching their custom WordPress website, Simply Sanding has done well to continually invest in the site, and for example, we’ve added a testimonials capture and display area as well as new information on a wider range of products and services as the business has evolved. Simply Sanding seeks to develop their brand by using their logo and fonts on vans, staff uniforms and even sponsors a local hockey team with jerseys emblazoned with Simply’s logo. By taking their brand seriously and seeking to develop local brand-awareness and a professional presentation the business stands out from others in their field. A business is nothing without its customers and Simply Sanding is committed to doing everything they can to leave every customer satisfied. Their efforts are not lost on their customers who add their glowing testimonials to an impressive and ever-growing testimonials page on Simply’s website. Marketing is crucial to getting your business in front of potential customers and in Simply’s niche there is fierce competition for keywords and search rankings. Simply Sanding makes a monthly investment in WordPress content strategy in order to maintain its excellent search rankings and through content marketing alone we have been able to achieve and maintain top 3 search rankings for the business year on year. Firstly, you need to get your site in front of customers. A WordPress content strategy is a great way of developing a strong search ranking for your site, which helps you to compete for visitors. Secondly, your site needs to support easy lead generation and something as straightforward as a quick contact form in a sidebar helps users get in touch as soon as they arrive on your site. Of course, effectively using your website to generate business is a little more involved than that and you can read more on how effective web design and online marketing can help your business to grow online.